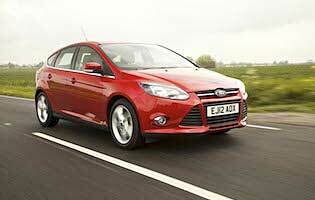 Ford's Focus has consistently been at or near the top of the sales charts since its introduction in 1998. This generation promises to continue this success with a raft of new technology, greater levels of refinement and a cleaner, greener range of engines, including an innovative three-cylinder petrol unit. At its original launch the Focus stunned both the media and public – nothing like this had ever come from the Ford design office. The following years have seen a progressive evolution of the Focus shape, with this variant delivering a bigger, chunkier look that's a world away from the lean, angular original. Along with the car's looks, a lot has changed under the skin. As with so many of its rivals, green motoring and an increased focus on safety has taken priority in buyers' minds. The five-door Ford - there is no three-door option - doesn't disappoint; the inclusion of more economical engines and premium-level safety kit (lane departure warning, auto brake, in-car speed limit display) are all welcome. While the car's performance remains key to its appeal and should still put a smile on the faces of ken drivers, there's also been a conscious move towards driving down fuel consumption and emissions. Nowhere is this more obvious than with the inclusion of a range of three-cylinder petrol engines. These 1.0-litre turbo units promise low running costs yet should deliver decent performance and refinement without any major compromises. Branded as EcoBoost engines, Ford is hoping that the buying public won't be put off by the engines' modest on paper capacity but will focus instead on horsepower. In this case it's a reasonable 125 horsepower in top specification. Coupled with options such as various intelligent safety systems and high-end audio features, there's every chance such equipment and engineering developments can elevate the Focus above the massed ranks of otherwise similar rivals in a crowded market. This generation Focus retains much of its predecessor's bold exterior and blends it with welcome advances in safety and entertainment technology to delver a rounded and engaging driving and ownership experience. Factor in the advanced three-cylinder engines and its fair to say that Ford has pushed the envelope in an otherwise conservative sector of the market. Ford prides itself on the affordability of the Focus, and there's no doubt that running costs across the range are modest while the dealer on every corner scenario should ensure wallet-friendly and convenient servicing. In EcoBoost guise the on-paper savings don't quite materialise in the real world, as the three-cylinder engine does need more throttle than you'd expect to maintain a reasonable pace. Fuel economy remains good, but it's not quite the impressive performance it could be. Front seat occupants fare well, rear passengers to a lesser extent but that's to be expected in a mid size family hatch. In reality there's ample space for a growing family if you're not a fan of the compact people carriers, although the likes of Ford's own C-Max will be a more versatile proposition. Thankfully the Focus' boot is a good size and the rear seats fold with relative ease. This generation of Focus' boasts easer to read dials, and the prospect of crisp, colour displays. The flipside is being faced with a considerable array of minor switchgear in the central part of the fascia would could be more intuitive – the competition has the Focus licked here. The car's trip computer could also be simpler to operate, although the data available is comprehensive. Voice control can fill the gap for many features, but you nee d to be patient to make it work reliably. The cabin is a nice place to spend some time in, thanks in part to the car's supportive seats, a good driving position and only small levels of wind and tyre noise to contend with. There's ample room up front for two adults, while it's a surprisingly pleasant experience in the back. The normally hushed EcoBoost 1.0-litre engine rarely makes itself known – it's only really vocal if you're pushing hard. Remote central locking with deadlocks and an engine immobiliser are all present, while the hatchback's load cover appears sturdy enough to keep out prying eyes. There isn't much in the way of covered storage space apart from the glovebox, however. Along with the usual array of airbags, stability control and anti-lock brakes, Ford has redoubled its efforts to compete head-on with the likes of Volvo. Available as options, a speed limit sign-reading camera displays the limit in the driver's view; blind spot and lane departure warning systems do as described and a 'city safe' auto braking function detects and acts if a low speed collision is predicted. And the good news is that all this technology is surprisingly affordable. 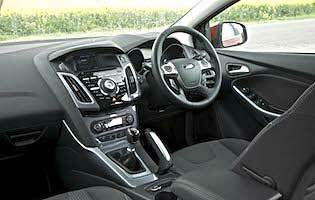 Ford has for a long time prided itself on delivering a car that will please keen drivers. This Focus is no different, although the increased refinement means its limits are much higher and you need to push harder to experience the class-leading performance. In three-cylinder EcoBoost guise the focus is biased towards economy; spirited driving will see a dip in fuel economy and there's little to be gained in outright speed. That said, the car's compliant ride and the 1.0-litre motor's low noise ensures that you can still have fun at a modest pace if you so wish. 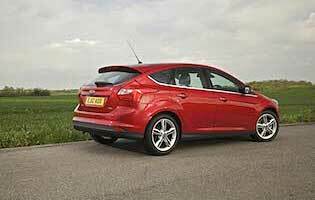 The Focus makes a sound first car if you don't fancy the confines of a supermini. Easy to use controls are complimented by good visibility and a comfortable driver's seating position. Running costs aren't that bad either, and if you've got a particularly light right foot the 1.0-litre variants could offer enough in the way of savings to take the plunge. Ford has done much work to boost the car's overall quality performance. Refinement, equipment levels and innovation are all up on the previous generation, although it's fair to say the Blue Oval badge still lags behind products from the likes of Volkswagen when it comes to perceived quality and image. Still, for many it's the default choice, which is also something of a compliment. There's little chance front and rear seat occupants will experience trouble getting in or out thanks to the car's wide-opening doors. The high seating position also makes access and egress easy. The tailgate is also easy to open, plus there's a large aperture for easy loading. All the basic features are present, but the main controls can be a little fiddly – some buttons are very small. Most functions can be accessed via steering wheel controls, though. Connectivity isn't a problem, with Bluetooth phones and MP3 players catered for. Sat-nav is an option but can prove fiddly to use. To compliment the car's bold exterior, equally bold colours prove surprisingly flattering. In contrast, darker hues tend to mask the Ford's many styling details. The cabin is less sombre than before, what with the brighter centre console adding some much needed light relief. Forward visibility is good, even if you can't quite see the end of the bonnet, while the view to the rear is more than adequate. The car's steering, which is nice and light and requires little effort to turn at low speed, also helps. Rear parking sensors prove invaluable if you're to avoid a minor scrape. Spare wheel fitted as standard. Petrol engine options – 1.0-litre (100bhp, 125bhp); 1.6-litre (85bhp, 105bhp, 125bhp, 150bhp, 182bhp); 2.0-litre (250bhp). 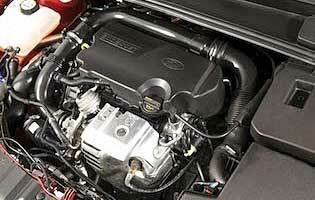 Diesel options – 1.6-litre (95bhp, 105bhp, 115bhp); 2.0-litre (140bhp, 163bhp). Transmission options: five and six-speed manual gearbox, six-speed 'Powershift' twin-clutch automatic on selected models. Trim levels: Studio, Edge, Zetec, Titanium Navigator, Titanium X Navigator, ST.